6/10-Final product. I had to add another ruffle row for length. This fabric is so light and soft; perfect for warm days. 6/1-Finally I have finished this dress. I’m very happy with the contrast black ribbon. I was really iffy about the black because I have always been against black for little girls but it really compliments the tea color nicely. I did a single silver and black floral button at back. 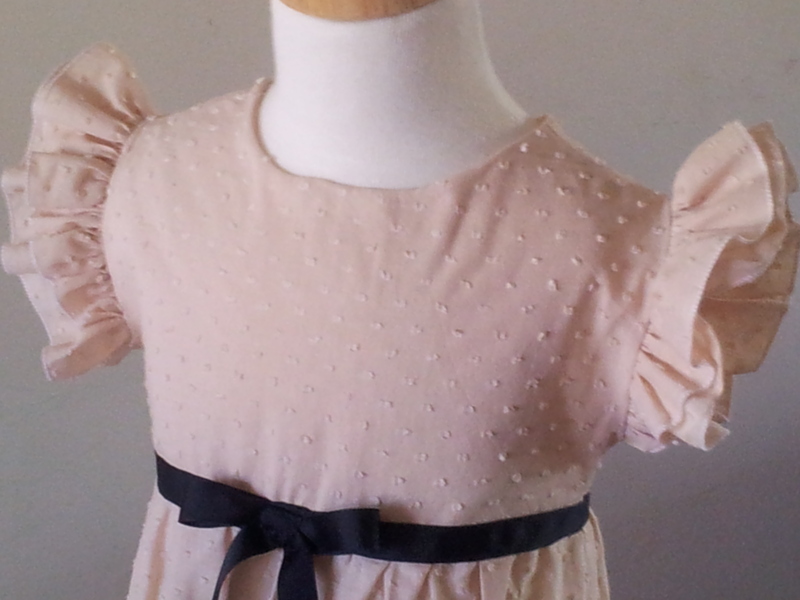 Ill be taking it to the little girl for a fitting now to complete hem and length of black ribbon tie. 5/31-OK now we are getting somewhere! I’m happy with the reduction of the sleeves and added layer in the bodice. The neckline looks more finished and there is no need for a neck edge trim. Now working on raising the waistline. 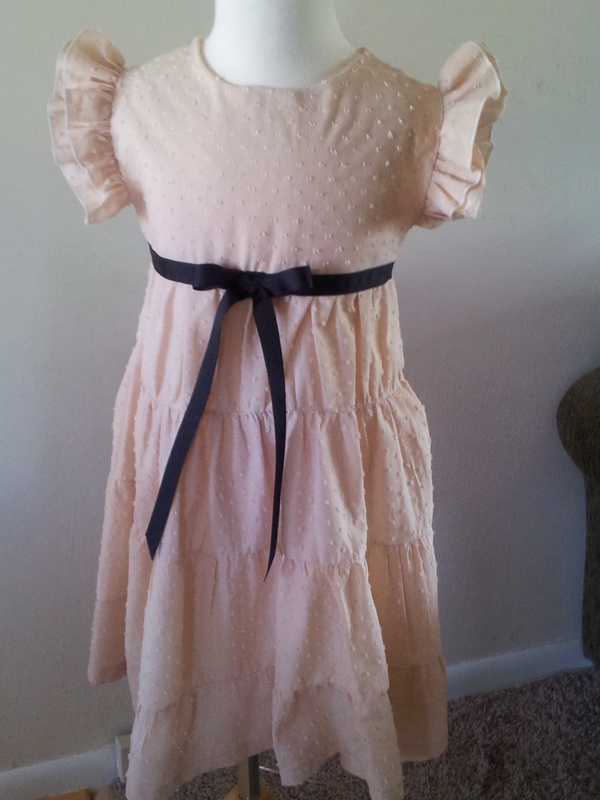 5/29-Today I began a new dress that is going to be worn by a 5 yr old in a photo shoot of my items. The pattern is by Butterick pattern no. 7094 from 1932. The ripped and tattered pieces are not easy to work with. Secondly, these vintage patterns are NOT printed on. They are blank with a variety of hole sizes punctured in the pattern tissue. The different size holes act as a map legend with the instruction page which I may say is uninformative. The instructions will say fold on-line where three medium size holes are in a row. You look at the pattern tissue and it looks bullet hole ridden. 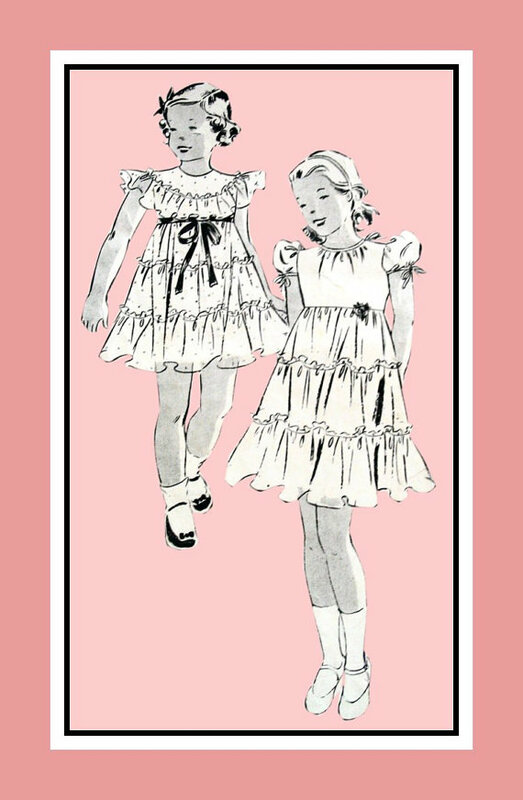 I will also mention that there is a whole page devoted to how to alter the pattern for “the chubby girl”. Those were Simplicity’s words. The dress its self was simple enough a tank top bodice with 3 tiers of ruffles as the dress. Single button in the back with lap. Well, here we are on the 21st c. and I have a ruffler for my brother se400 sewing machine. It’s a large and unusual foot but of takes all the work out of gathering fabric with the basting stitch. So I thought how bad can this be? So, I begin on the first tier and it ruffled so much that I couldn’t evenly join of to the second tier. Ugh, had to rip that all out. Then I loosen the ruffle…much better. I continue with the remaining tiers and price them together and ready to use my serger to attach each tier to the next. Oh no! My serger gobbled up some of the dress I had to rip that all out and do that whole tier all over again with the ruffler. Let me say this happened twice! Finally I have the tier’s together with the bodice. The material is just beautiful. I am using Swiss dot batiste (very vintage) that I stained with tea bags. 30 tea bags in a soup pot for half hour will do the job. Make sure to set the stain with a bit of vinegar water.